Despite a rapid expansion in the merit shop, also known as open-shop, construction labor force throughout New York City, workers lacked a voice to advocate on behalf of their interests regarding policies, non-union training programs and barriers to entry instituted by union officials. 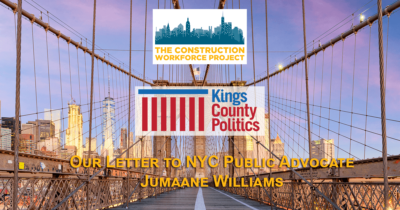 The Construction Workforce Project (CWP) seeks to fill that void by educating both the public, elected officials and other community stakeholders about the benefits of merit shop construction while advancing initiatives that align with the broader needs of communities of color and other underrepresented minorities in the New York City region. Specifically, CWP’s targeted policy objectives focus on initiatives that increase access to merit shop jobs in the city and policies that streamline construction work to repair and fortify our public housing and public transit infrastructure. Ultimately, our belief is that any legislation which restricts an individual’s ability to work in their industry of choice is detrimental to local job growth. With more than 70 percent of the merit shop workforce being Black or Latino, our role in bettering these communities’ work opportunities is critical to pushing back on union excesses and securing the future of these workers. La gran mayoría de las metas legislativas del presupuesto estatal para el 2019 fueron aprobadas por la legislatura de Nueva York, incluyendo la prohibición de bolsas de plástico, la introducción de precios de congestión y nuevos impuestos de mansión. Almost all of the reported legislative goals of the 2019 New York State budget passed— a plastic bag ban, congestion pricing, and a mansion tax. However, noticeably missing from this year’s budget was a prevailing wage expansion. CWP greeted attendees of Gov. Cuomo’s speech today with educational flyers highlighting negative impacts of any potential prevailing wage expansion on communities of color. Construction Workforce Project Hosts inaugural OSHA 10 Class in Harlem, New York City. As an advocacy group for New York’s non-union, open shop workforce, the Construction Workforce Project (CWP) is reminding New Yorkers how any prevailing wage will sabotage hard-earned employment and housing opportunities. Troy’s unemployment rate remains higher than the national average, and many residents are not seeing access to great job opportunities. Rather than address the problem, the legislature is currently considering a prevailing wage expansion that has the potential to exacerbate the situation and further hurt the city’s working families. A policy couldn’t be built on a shakier foundation. Open shop workers are the silent majority in New York’s construction workforce. In fact, approximately 70% of private developments in the city are now being built by these workers. And as the use of open shop expands, more New Yorkers of color are working more than ever before. If there’s one thing that New Yorkers can agree on, it’s that we should always strive to create new jobs, not take them away. Amazon’s recent decision to withdraw its planned “HQ2” from Long Island City is an example of us failing on this front.